It's Hip 2 Serve! : Nature's Source Cleaners=Moneymaker at the Commissary! Nature's Source Cleaners=Moneymaker at the Commissary! 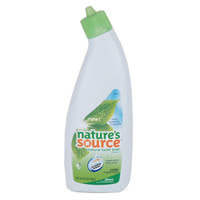 Here is an easy way to snag 3 bottles of Nature's Source Toilet Bowl Cleaner for FREE plus pocket some change as well! Purchase 3 of these cleaners for $1.39 each and use 3 $1.00 off any 1 Nature's Source Natural Cleaner from the 9/13 SS. You will pay $1.17 total after coupons. The best part is that you can then submit for a $5 rebate using the form found here which means you get 3 toilet bowl cleaners for FREE and you make over $3!! (Even without the coupons, you can still snag the 3 cleaners for FREE after the $5 rebate and pocket some change).